Not the title I wanted for my race report, but this time it’s the one I’ve ended up with. If things had gone to plan then I would have got the Hawaii slot, but they don’t give those out for planning a race. I was optimistic in the weeks leading up to this race, but still on the day the outcome wasn’t what I anticipated. I realise it can seem odd to be complaining about a sub-10 hour Ironman, but at this point I expect more. The week leading up to the race really didn’t go to plan. My training was off. I felt lethargic and my motivation was low. Early in the week I had a day or two of stomach issues which didn’t help either. The end result is I didn’t train too much in the build up. Whilst there’s good in extra rest in this case I think there wasn’t enough training. On the other hand on the couple of occasions I went for a run I had serious tightness and discomfort in my left calf and leg. I can’t say why these came on yet, but suddenly running was an issue. None of these things were encouraging prior to the race, but I decided not to dwell on the issues. My time in Port Macquarie has been great. I got to catch up with a few friends from training and racing around Oz. I’ve done another photo shoot with Jaggad in my new kit. Again great fun to do, never thought I’d add modelling to the resume! The kit looks great, very bright and gets you a lot of attention. Also confuses the Aussies when you’re wearing Aussie colours with a kangaroo on, but your helmet has Union Jacks plastered on it! I helped out at the expo too which is great too and you get to meet lots of different athletes. Other than this I spent my time relaxing as much as I could. I carbo loaded the day before, going the route of eating a lot of energy bars in addition to normal meals. However I think I didn’t really consume enough food in the run up and relied too much on the bars. I slept pretty well both the night prior to and the night of the race. Despite this I felt pretty tired both days and I woke on race day wishing for a few more hours in bed! I found eating difficult, far more than usual and probably consumed less calories for breakfast than in past events. Whether there were sufficient calories in it my diet prior to and during the race caused no stomach problems for a change. I’d been very efficient in setting up my kit so getting ready was simple and I had a short lie down before heading to transition. I was in the water about 5 minutes before we were due to start. The exact start time seemed a little unclear as the announcers were clearly hurrying us to be ready for the start. I placed my self towards the outside edge of the swim and right at the front. Or at least the front with a couple of minutes to go. Slowly people started drifting forward until the cannon went. Foolishly I didn’t so when the gun went I was swamped and blocked in. Also I should note I chose my position poorly. The first half of the swim was spent trying to find any kind of space. I was blocked on all sides and could only go with the flow. It was obvious that swim technique was out the window. I had no idea of pace other than the fact I was stuck with the white caps all round me rather than my own blue caps. By the start of the second lap I started to find clear water as people slowed. With clear water I could finally find some kind of rhythm and at least attempt better technique. The second lap progressed comfortably, but I don’t feel I pushed enough when I could. Getting out of the water I was disappointed, but not entirely surprised to see a time of 1:05 on the clock. Whilst some aspects of this were out of my control my choice of position at the swim start and a lack of open water practice of late probably contributed to the poor result. I didn’t panic just reminded myself there was a long day ahead. I will admit I was less optimistic than normal. I squelched through the muddy transition. Severe rains on the East coast have caused some major flooding though in Port Macquarie the worst they’d done was create a lot of mud. Onto the bike and things felt fine at first, nothing to worry about. The course starts with a few sharp hills and I definitely took these too hard. Once out on the flat I started to move past the groups that were ahead of me. I had a lot of people to work through after such a poor swim. Conditions were windier than I expected and there was a good dash of rain in there too. Not ideal for fast times, but I worked to my heart rate goals. As I’ve come to expect in most races there was a fair amount of drafting going on amongst age groupers. I spent some of the second lap with a small bunch persistently overtaking me then slowing. Eventually I let them go and took on some gels. Towards the end of the second lap I finally started to feel good. For the first time in the race I didn’t feel too bad. Sure things were sore, but I started to move up the bike field a little more efficiently. I think adding a couple of bars to my bike nutrition certainly helped and gave me a few more calories. This is certainly one area that I got right on the day. The third lap, whilst actually slower than previous ones went quite well. I reeled the irritating bunch back in and left them behind without having to dig too deep. I was glad for some confirmation that sticking to my own race plan rather than racing a bunch paid off. When I came in from the bike I was pretty much on my 5:15 goal. That meant that the closer I could come to 3 hours on the run the closer to my overall goal. I was feeling a bit better and perhaps even a little optimistic. Not having compression socks to deal with I was a bit quicker through transition. The muddy, wet conditions made it impossible to avoid leaving with wet shoes and socks. Almost immediately I felt bad on the run. I was clicking off the kilometres at a pace for a sub-3:10 marathon, but my legs were sore. It didn’t really relate to pace, they just ached. This was definitely new, usually I feel great for the first 5 to 10km and need to hold back. I was not in a good place and was mentally quite withdrawn not really taking in my surroundings much. Despite this I kept good pace till around 30km. I was carrying my own nutrition for the run for the first time and it had worked well so far. At about 90 minutes into the run my first bottle ran out. The flavour in the second bottle turned out to be vile! I’ve used it before, but right then I couldn’t stand it. From that point on my energy intake was a bit low. Having my own calories however works very well as long as I have enough for the run! Those last 12km were agony, I can only think of one other time I’ve hurt like that in a run. At World Long Course last year where I gambled on not needing much nutrition. Whilst running out of palatable gels certainly impacted the run, the soreness had been present in my legs from the start. I’m a little concerned as usually the run is my strength, but I was struggling. My pace was all over the place in the final stretch and most concerning was my normal strong finish was gone. I had nothing and practically limped home. I can’t honestly even remember the finish chute properly! So that’s it. Not what I wanted or expected. Despite this I’m still feeling pretty positive. I know I can race better than that. I’m sure it was a bad day rather than my best performance. I admit I had moments where I’ve questioned that, but I have to keep moving forward and trusting in what I’m doing. I take some encouragement that my position in this race was much lower than in my recent major races. To me that’s a strong indicator that I wasn’t on form. I have no definite answers as to what went wrong, but I have a lot of ideas. 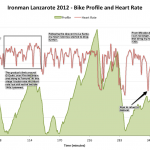 With seven weeks till Ironman Lanzarote my priority is to recover and to deal with my run issues. I will have a few weeks to focus on some quality training and hopefully get myself back on track. Next time I want to finish with a more positive post.